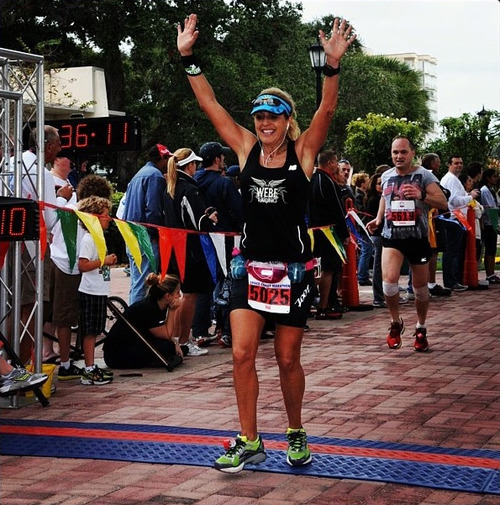 Sue Caplan from Boca Raton, Florida, is a mom, triathlete, runner and owns WeBe Running with friend Lisa Rose. Sue’s been running and doing triathlons for 10 years and considers it her escape! WeBe Running was their fun way to keep accountable and stay in shape. She did her first marathon in 2012, Ironman in 2014, and has been doing RunWithMe races since Jan 2015! Q. What’s your longest run? Q. Do you have any dream races or dream runs you aim to complete someday? Q. Do you run often with other people or alone? Q. What or who inspires you to run.. even on the hard days? Q. Do you remember the first moment you felt “like a runner”? Once a season, I feel it while I’m running – the change from being in training to feeling like a strong athlete. It takes several months to get to this point! Q. How do you measure success as a runner? When running 6 miles is no big deal, also when I PR a time or distance goal. Q. What’s the coolest connection you’ve made because of running? Q. What role does RunWithMe play? RunWithMe has taken me to another level. Q. How does running fit into your schedule? Dark and early in the morning, or just around daybreak! Q. What’s your favorite thing to think about or talk about while running? Q. What’s one word that best describes what/how running makes you feel?